It's time to wake up and smell the roses, people. The services industry is going through its most seismic challenge as increasingly sophisticated enterprise clients are looking to reduce their reliance on labor-based services and clunking archaic on-premise technology. While some services and consulting firms have their heads buried in the sand, clearly in denial that the services model has already entered into a fundamental shift, others are recognizing that they need to get ahead of this - and fast. 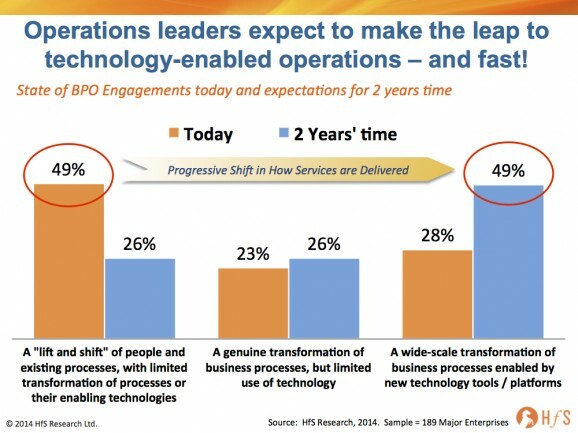 We ran a study earlier this year that explored the role of technology when enterprises outsource their business operations, and the findings from almost 200 major enterprises couldn't be clearer: half of today's enterprises are expecting to take the leap to enable their business operations with new technology tools and platforms in barely a two-year time-frame. Operations leaders don’t have the luxury of ten-year improvement programs anymore – corporate leadership expects to see tangible results in much shorter timeframes. You only have to look at the growing number of unemployed CIOs to understand what happens when functions become overly-operational and limited value and innovation is achieved. It’s the same for CFOs, CPOs, supply chain heads and other function leaders – most are under a renewed pressure to continue driving out costs, while delivering ongoing improvements to data quality and having greater alignment with front-office activities. The old "we need to fix our ERP first" excuse just isn't cutting it as much these days. This is why 49% of today’s enterprise buyers expect to move to a “wide-scale transformation of business processes enabled by new technology tools/platforms” in just two years. Yes, this may be a pipe-dream for some enterprises, but what's clear is that many of those operations leaders failing to steer their enterprise away from legacy delivery models will get cast aside quickly in today's tolerance-diminishing business environment. One recent provider re-organization that quietly took place was the merger (see link) of Accenture's Operations with its its infrastructure and cloud services division to create a ~$5.7 Billion (HfS estimate) business unit. This follows on from the firm's recent renaming of "BPO" to "Operations", where the intent was always to extend the service suite. Now this is significant. When you talk to buyers today, most will tell you that having to deal with the technology and operations/BPO divisions of providers is akin to dealing with two separate companies. There is often very little synergy - and very different working cultures - between those people which deliver business processes and those who design, develop and maintain technology solutions. 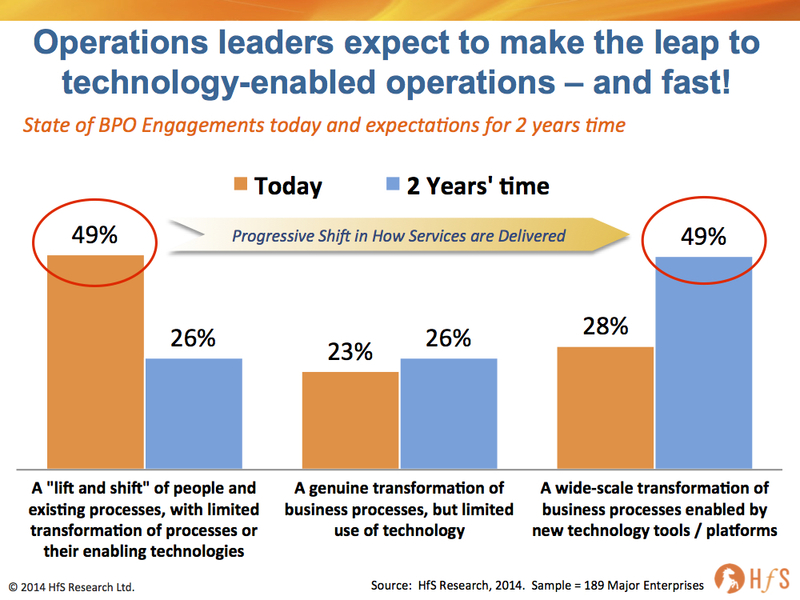 It's been a major impediment to the progression of the BPO industry, and one of the key reasons why 49% of enterprises today (see above) still find themselves trapped in a "lift and shift" purgatory. Having IT infrastructure and operational talent together should help to break down these barriers and create a culture of enabling technology-driven services, moving processes into an "As-a-Service" model and creating the skills and acumen that providers need to make the delivery of "As-a-Service" effective. 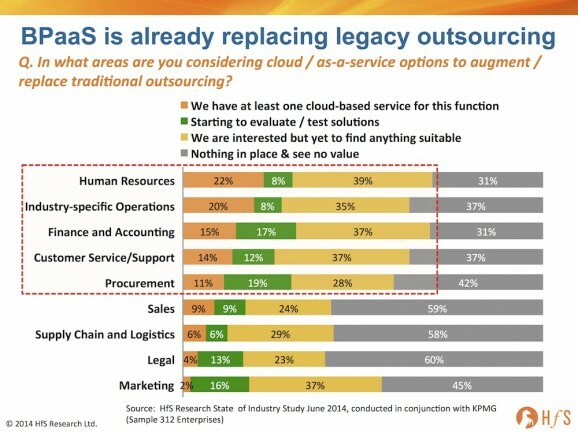 Simply put, BPaaS (Business-Process-as-a-Service) delivery is not as dependent on transactional processing scale, as most these processes are now full automated in the cloud; instead the successful providers will develop their BPaaS businesses around providing teams of analytical, creative and digitally-centric talent - areas where most enterprises already recognize they have real talent shortages. For example, many enterprises have already taken the leap to Workday, but some failed to invest in the right services expertise, not only to implement the product, but to go through the requisite change management and organizational redesign needed to get the maximum benefit from the cloud solution. It's already clear from the Workday example alone that outsourcing and cloud need to be delivered as one seamlessly-accessible service, where outsourcing is technology. Most enterprises adopting cloud products and expecting simply to "figure out" how to enable the operations around them are going to go through a lot more pain and long-term frustration that they ever anticipated. To this end, having a provider which understands and can implement a cloud platform, support the transformation and provide the necessary services that add real value to the front-office is the Holy Grail for many buyers. For Accenture, having both these breeds of experts working even more closely together will surely help drive forward these types of conversations even faster, but with an eye on both the cloud benefits and the services acumen to implement and services cloud solutions effectively. This should be of particular benefit to areas where Accenture has been making discreet software investments that support major service areas, such as Accenture Credit Services' mortgage origination platform and its Octagon clinical services management platform. Rolling out a comprehensive As-a-Service delivery model across the sheer breadth of vertical and horizontal areas in which a global provider such as Accenture operates, is going to take major investments in future software platforms (whether developed in-house or acquired), strategic alliances with software firms and niche specialists, and ongoing investments in training and reorientation of its own services talent to provide higher value services for clients. When providers section-off process delivery and operations from technology, it nearly always makes it challenging to get the right access to funds, align all the stakeholders that matter, and make meaningful, credible business cases. Quite simply, operations people talk a different language to technology people. Having operations and infrastructure in the same unit creates more opportunity for transformational thinking at the solution-architect level in operations, by increasing awareness of - and exposure to - emerging technologies. 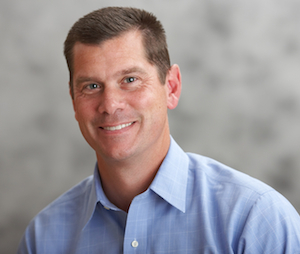 In addition, having a group head in Mike Salvino (pictured), who comes from a business operations mindset with a focus on business solutions, should help focus the new division on service delivery aligned to solving business needs, as opposed to merely technology products. Providers which leave their current clients trapped in a status quo of averageness, will be the losers in this new era of services. The table-stakes of services have shifted rapidly in just a few short years, where ambitious clients are now expecting providers to come to the table with the ability to transform their operations and add real capability in areas that are much more "front-office" focused. There are also a large number of clients (at least half, according to our research mentioned earlier) who are still at a phase where they haven't yet really changed anything - they still run the same old processes the same old way and are clearly challenged to incorporate the benefits of cloud delivery and digital into their operations. If these clients' providers cannot bring the new world of As-a-Service process delivery to the table, many will walk from their incumbents - and there have already been some notable defections this year from clients, clearly fed up with the paralysis of their current provider to deliver anything more than the same old processing and very little capability (or impetus) to improve them. Simply-put, it's not in some providers' interests to help their clients change the status quo - often there isn't enough money in it for them, or they just don't have the caliber resources to help them. Providers prepared to be bold and get ahead of the curve - and make the necessary investments do to so - will survive. It's still early days, and providers like Accenture can't yet declare victory, simply because it recognizes the seeds of change and is actually doing something about it. And several other savvy providers clearly sense what the future has in store, and are making their own beds in preparation. However, the shift to the As-a-Service era has already begun and there are going to be many painful experiences as cash-rich legacy engagements are ejected and several providers disappear into the tier of insignificance, or are broken up and submerged into other entities altogether. The winners are those which can bring together higher-value service capability that inspires creative and analytical thinking, and twin them with real cloud delivery - either through their own platforms, or those of their partners. Indeed a Paradigm shift and one first to start is already ahead in the race. Automation drives the future. Very good analysis of the market and the changes occurring. Agree that technology has become critical to the outsourcing value proposition - the amount of times I have heard clients use their ERP as an excuse for getting anything done! @Seamus: we have identified technology as the number one impediment to process improvement in so many enterprises. I mean, we have clients who can't get stuff done because they do not have IT people who can code correctly! Not to mention the paralysis created by multiple versions of ERP... I remember when someone once said "implementing ERP is like pouring concrete into a company". Great article. Agree with you one hundred percent that this is a secular shift taking place. I believe this is perhaps the most exciting time period for the Outsourcing industry. One question: Do you see many clients seeing this as an opportunity to monetize their assets, say technology applications and business processes?